In total, some 39% of older adults fall into one of these two categories, and they are significantly less likely than seniors who do not face these physical challenges to go online (49% vs. 66%), to have broadband at home (38% vs. 53%), to own a cell phone (69% vs. 82%), and to have a smartphone (13% vs. 22%). 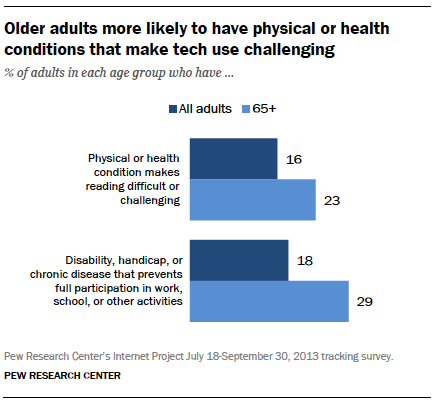 Interestingly, differences in technology adoption between these “physically challenged” seniors and the rest of the older adult population are somewhat more modest when it comes to tablets and e-book readers. Some 22% of seniors with a life-impacting disability or chronic disease, or a physical condition that makes reading difficult, own either a tablet computer or an e-book reader, just eight percentage points lower than the 30% ownership rate among seniors who do not have any of these conditions. In addition to the issues of health or disability discussed above, a substantial majority of seniors express trepidation about using new digital tools or devices without assistance. When asked how they would learn how to use a new technology device such as a tablet computer or smartphone if they wished to do so, only a small proportion of seniors—18%—express comfort with learning how to do so without assistance, while 77% indicate that they would need someone else to help them. Not surprisingly, this concern about “going it alone” with new technologies is especially acute among seniors with limited exposure to these devices. Among seniors who do not currently own a smartphone, a tablet computer, or an e-book reader, just 13% would feel comfortable attempting to use a new technology device without assistance. At the same time, even those with some level of exposure to technology express a fair amount of trepidation about branching out to new devices without assistance. Among older adults who do own one or more of the devices listed above, 29% would feel comfortable using new devices on their own—but 70% think they would need to ask for assistance. This general discomfort with new technologies also extends to online communications platforms such as Facebook. Among seniors who do use the internet but do not currently use social networking sites such as Facebook or Twitter, 56% say they would require assistance if they wished to use these sites to connect with friends or family members. Just 24% of these seniors feel comfortable jumping into the social media environment without someone there to guide them (the other 20% of these non-SNS-users were unsure how they would react or were unable to answer the question). Older adults who currently use a social networking site of some kind have more confidence in their abilities: some 68% of these seniors would feel comfortable using social media on their own to connect with family or friends. Once online, most seniors make the internet a daily part of their lives and view it in a positive light. Non-users are divided on the relative merits of going online. Although seniors are less likely than the rest of the population to go online in the first place, once there they tend to make the internet a part of their daily routine. Among seniors who use the internet, 71% go online every day or almost every day and 11% go online three to five times per week. The subset of seniors who have a smartphone or a home broadband connection go online with even greater frequency: 78% of older broadband users go online every day or almost every day, as do 84% of older smartphone owners. Seniors who do not currently go online, on the other hand, are much more divided when it comes to the benefits of technology. Half of these non-users (48%) agree that people lacking internet access are at a disadvantage and missing out on important information, with 25% agreeing strongly. But 35% of older non-internet users disagree with the assessment that they are missing out on important information—with 18% of them disagreeing strongly. Older social networking site users socialize more frequently with friends and family members than do non-users.